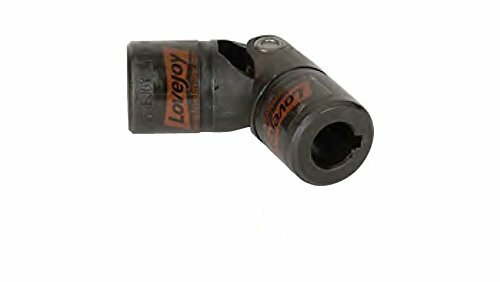 This Lovejoy D-Type universal joint is a single pin and block u-joint for connecting two rotating shafts with angles up to 25 degrees and speeds up to 1,750 rpm. It compensates for angular misalignment and shaft separation and has a single joint configuration for high torsional stiffness and torque capacity. The hubs, center block, and pins are made of 303 stainless steel for strength and resistance to corrosion. It has solid bore hubs for specific machining and a groove on each end for attaching a boot with a retaining ring. This universal joint provides a uniform speed ratio between driving and driven shafts, and is suitable for applications requiring moderate torque transmission, such as farm implements, material handling equipment, and drive shafts. Universal joints (also called U-joints, universal couplings, Cardan joints, Hooke's joints, or Hardy-Spicer joints) are used to transmit motion and rotational power, or torque, between two shafts that are offset at an angle. Most universal joints consist of two yokes and a middle assembly; the hub end of each yoke attaches to a shaft while the yoke ears attach to and pivot around the middle assembly to accommodate shaft misalignment. The type of middle assembly determines its usage pin and block joints are suitable for transmitting high torque, needle bearing joints are used to handle high rotational speeds, and ball and socket joints are used in applications requiring low backlash (play between moving parts). The body of the universal joint may include a single joint to accommodate only angular misalignments between shafts, or two joints to accommodate both angular and parallel misalignments. Available in a variety of materials and configurations, universal joints are used in applications including motor vehicles, conveyors, medical and optical devices, forestry and mining equipment, robotics and space exploration, and aeronautics, among others. Lovejoy manufactures flexible couplings, universal joints, variable speed drives, and other transmission and mechanical power products. The company, founded in 1900, is headquartered in Downers Grove, IL. Suit for RC model car and RC model boat. 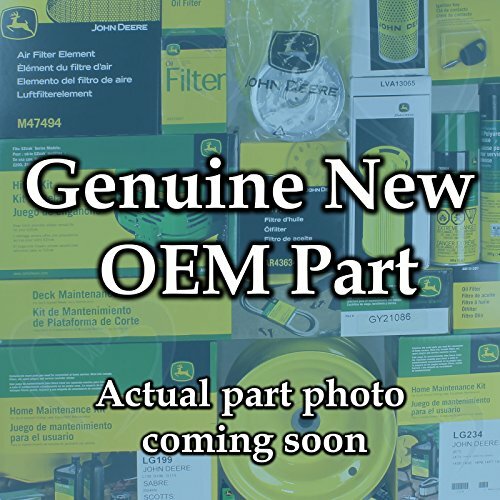 Perfect motor shaft fitting accessories. Durable and pratical for long-lasting performance. 4* 4mm indicates that one end inner diameter is 4mm and theother is 4mm. 6 * 6mm indicates that one end inner diameter is 6mm and theother is 6mm. Hello friend, please feel free to contact us if you have any issue or need further assitance, we are here for you! Thanks! 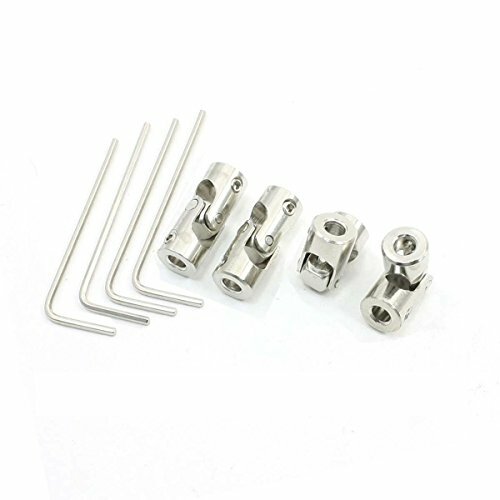 4 Pcs 6x6mm universal joint coupling + 8 pcs M4 screws +1 pcs screw wrench, 100% brand new and quality guaranteed! 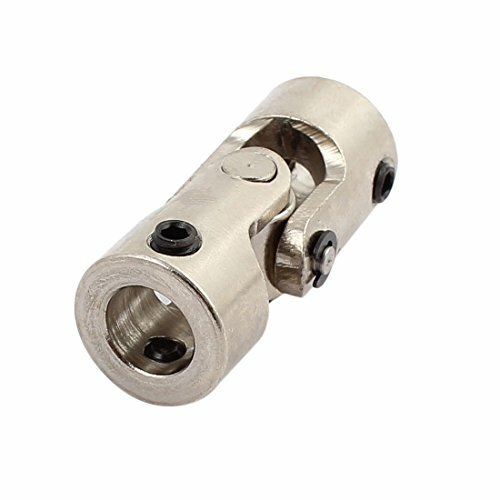 These 6mm shaft couplings suit for straight shaft motors,used for model cars, model ships, robots and other types of metal transfer. 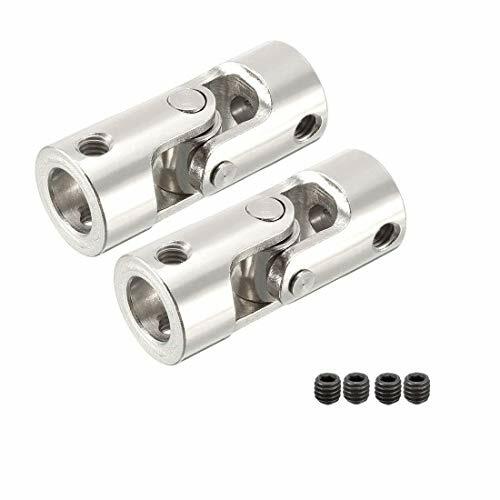 Motor couplings outside diameter: 11mm / length: 23mm, connection diameter: 6mm to 6mm/ 0.24 inch to 0.24 inch.CNC machine design, with perfect workmanship and precise size, the rc universal joint is easy and convenient to install and remove. 360 degree rotatable universal joint, this cardan joint can change the transmission direction at any angle, very flexible, allow the angle between the two axes within a limited range vary with operational needs, easy to install and uninstall. Made of high quality metal material with outstanding appearance, durable and practical for long-lasting performance. Please feel free to contact us if you have any issue or need further assistance, we are here for you! 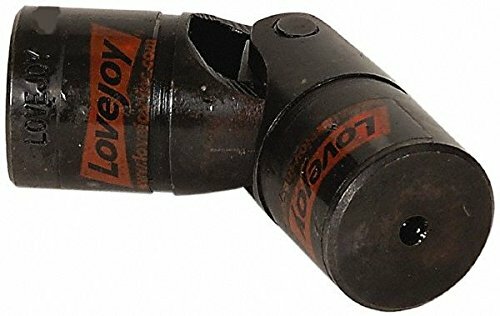 This Lovejoy D Type steel single pin-and-block universal joint with round bored hubs is designed to connect two rotating shafts at angles up to 25 degrees. This universal joint compensates for angular misalignments and has a single joint configuration for high torsional stiffness and torque capacity. The hubs, center block, and pins are made of steel for strength and durability, and the bored hubs fit onto shafts without the need for machining. Operating temperatures range from -30 to 212 degrees F. For optimal wear and extended life, boots (sold separately) are recommended, and boot retaining grooves are standard on this design. 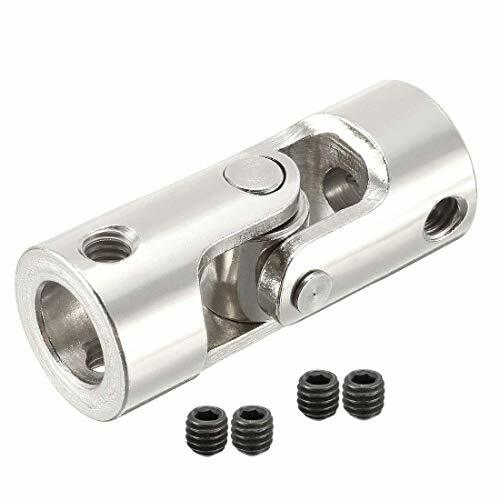 This universal joint provides a uniform speed ratio between driving and driven shafts, and is suitable for applications requiring moderate torque transmission, such as compressors, fans, machine tools, printing presses, and textile machinery. 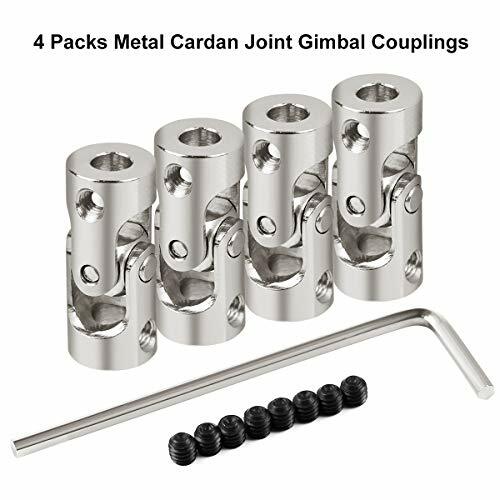 Universal joints (also called U-joints, universal couplings, Cardan joints, Hooke s joints, or Hardy-Spicer joints) are used to transmit motion and rotational power, or torque, between two shafts that are offset at an angle. Most universal joints consist of two yokes and a middle assembly; the hub end of each yoke attaches to a shaft while the yoke ears attach to and pivot around the middle assembly to accommodate shaft misalignment. The type of middle assembly determines its usage pin and block joints are suitable for transmitting high torque, needle bearing joints are used to handle high rotational speeds, and ball and socket joints are used in applications requiring low backlash (play between moving parts). The body of the universal joint may include a single joint to accommodate only angular misalignments between shafts, or two joints to accommodate both angular and parallel misalignments. Available in a variety of materials and configurations, universal joints are used in applications including motor vehicles, conveyors, medical and optical devices, forestry and mining equipment, robotics and space exploration, and aeronautics, among others. 4* 4mm indicates that one end inner diameter is 4mm and the other is 4mm. 6* 6mm indicates that one end inner diameter is 6mm and the other is 6mm. Hello friend, please feel free to contact us if you have any issue or need further assistance, we are here for you! Thanks! 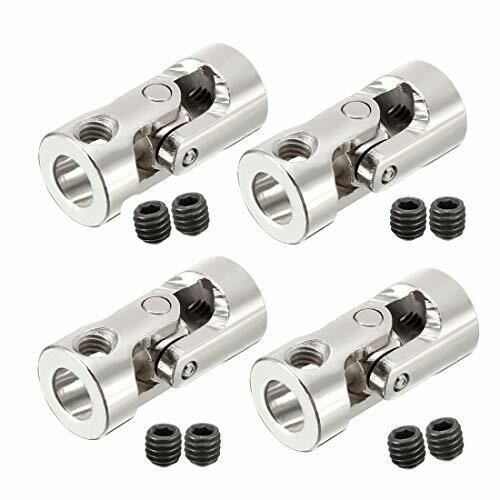 4 Pcs 4x4mm universal joint coupling+ 8 pcs M4 screws+ 1 pcs screw wrench, 100% brand new and quality guaranteed! 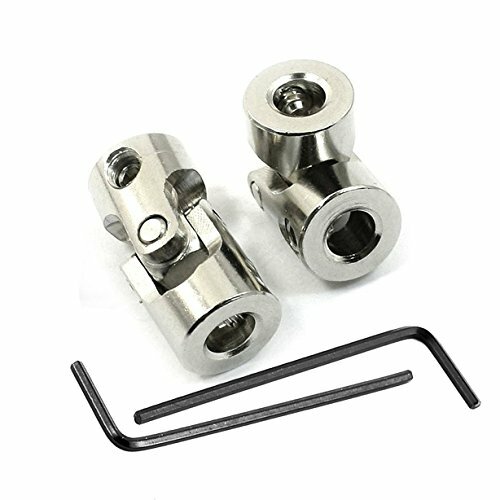 These shaft couplings suit for RC model car and RC model boat, perfect motor shaft fitting accessories. 4mm motor coupling outside diameter:11mm / length:23mm, CNC machine design, with perfect workmanship and precise size, the rc universal joint is easy and convenient to install and remove. 360 degree rotatable universal joint, this cardan joint can change the transmission direction at any angle, very flexible, easy to install and uninstall. 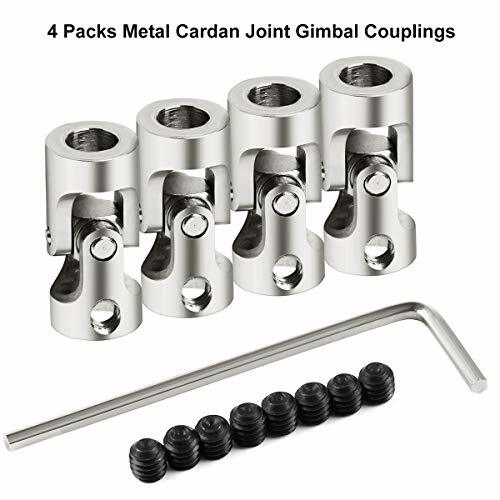 This Lovejoy carbon steel single pin-and-block universal joint with bored hubs, set screw, and keyway is designed to connect two rotating shafts at angles up to 25 degrees. This universal joint compensates for angular misalignments and has a single joint configuration for high torsional stiffness and torque capacity. The hubs, center block, and pins are made of American Iron and Steel Institute (AISI) 1144 carbon steel for strength and durability, and the bored hubs fit onto shafts without the need for machining. The needle bearing design allows up to 6,000 RPM for applications with continuous high rotational speeds. Operating temperatures range from -30 to 212 degrees F. A set screw secures the joint into position on the shaft, and a keyway prevents the shaft from rotating in the joint hub. For optimal wear and extended life, boots (sold separately) are recommended, and boot retaining grooves are standard on this design. This universal joint provides a uniform speed ratio between driving and driven shafts, and is suitable for applications requiring moderate torque transmission, such as compressors, fans, machine tools, printing presses, and textile machinery. 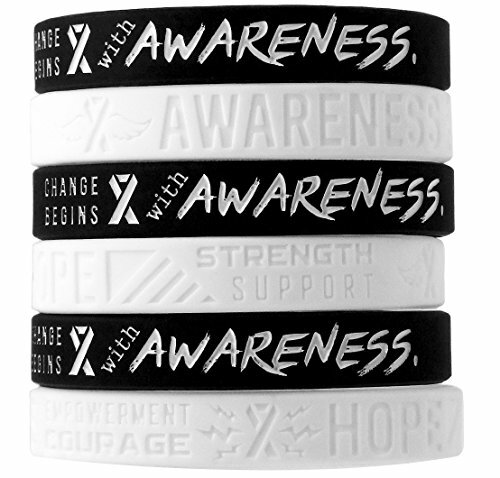 This bulk pack of 1 dozen silicone awareness wristbands features the white awareness ribbon color theme. Included in this bundle pack are 2 unique designs: "Change begins with Awareness," and "Words of Awareness, Hope, and Strength." The white awareness ribbon represents a variety of causes, including: World Peace, Dating Violence Awareness, Emphysema, Lung Disease Awareness, Multiple Sclerosis Awareness, Bone Disease Awareness, Osteoporosis, Blindness, Brain Injury Awareness Month, Postpartum Depression Awareness, Pro Life, and more. White/neutral color theme fits any awareness campaign or non-profit cause. Use these wristbands to raise awareness for your cause, for non-profit fundraising and event giveaways, and for everyday wear. 360 degree rotatable universal joint. Ideal accessories for RC Model motor, such as airplane boat model. 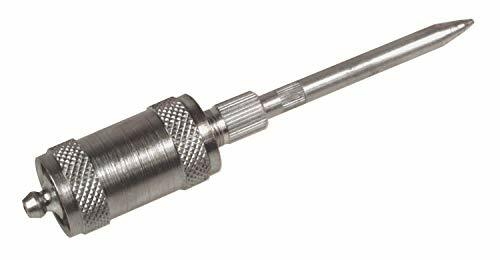 Alemite B6783 Needle Nose Adapter, For Use In All Universal Joints & Lubrication Tight Spots, Consists of Contact Nozzle & Locking Sleeve, Length 5"
Alemite manufactures lubrication and fluid handling systems and components. The company, founded in 1918, is headquartered in Fort Mill, SC. Allow the angle between the two axes within a limited range vary with operational needs. The coupling is great replacement for your old or broken one. 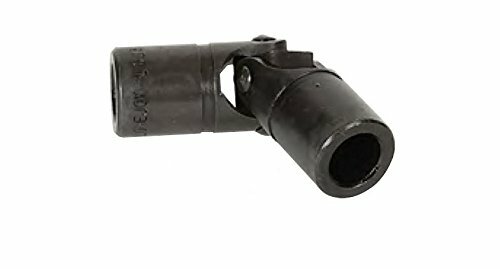 This Belden universal joint boot cover made of nitrile rubber helps retain lubricants and provides protection against contaminants to extend the life of the universal joint. 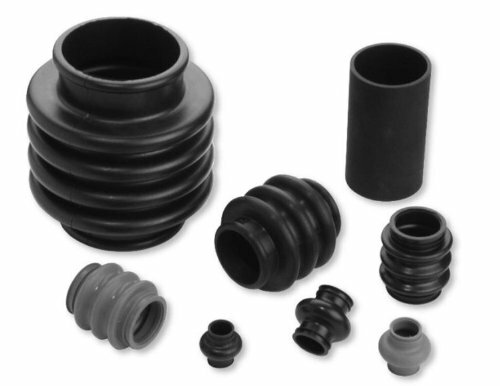 Nitrile rubber exhibits high tensile strength, resists abrasion and tearing, and is compatible for use with petroleum-based oils, hydrocarbon fuels, alcohol, water, and acids. The boot slides over the joint and is typically secured in position with ties (not included). Depending on the boot model, the boot may have single, double, or triple bellows. Belden universal joints are suitable for use in various consumer and industrial applications, including drilling and tapping machine tools, pumps, textile machinery, and medical and optical devices. Belden manufactures precision universal joints and power transmission assemblies. The company, founded in 1939 and headquartered in Broadview, IL, meets International Organization for Standardization (ISO) standard 9001:2008. 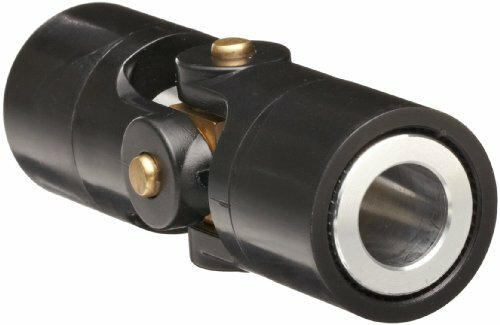 This Boston Gear JP371/8 single universal joint is a molded coupling for connecting two rotating shafts at angles up to 45 degrees. It compensates for angular misalignment and shaft separation and has a single joint configuration for high torsional stiffness and torque capacity. It has a molded polymer body for vibration dampening and electrical insulation, and it has a nickel-plated brass spider and insert for resistance to corrosion. Set screws secure the joint into position on the shafts, and each hub has a .125" bore for connecting shafts of the same diameter. 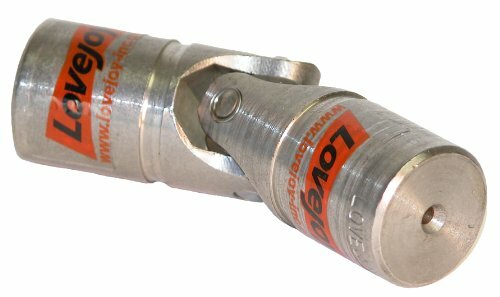 It has a maximum ambient temperature of 180 degree F. This universal joint provides a uniform speed ratio between driving and driven shafts, and is suitable for applications requiring moderate torque transmission, such as farm implements, material handling equipment, and drive shafts. Boston Gear manufactures gears, gear drives, bearings, valves, shaft collars, couplings, and other power and fluid transmission components. The company, founded in 1877, is headquartered in Charlotte, NC, and meets International Organization for Standardization (ISO) standard 9001:2008 standard. 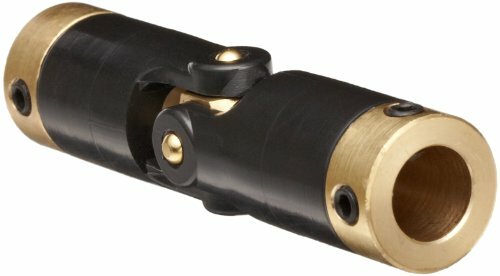 This Huco Huco-Pol Acetal single universal joint has yokes, headed bore inserts, and cross pieces made of brass with a chromate and passivate finish for strength, durability, and resistance to corrosion. The hubs are black-oiled alloy steel for strength and corrosion resistance, and the Acetal body electrically isolates the shafts to prevent electrical arcing and circuit shortages. It supports up to 1000 revolutions per minute, and can operate in temperatures ranging from -4 to 140 degrees F (-20 to 60 degrees C). This Huco-Pol Acetal single universal joint is suitable for use in applications where misalignment results in low stress loads such as in electro-medical and laboratory equipment, business machines, and food processing systems, among others. Huco Dynatork manufactures couplings, piston air motors, brakes, clutches, gear boxes and other transmission products. The company, founded in 1965, meets the quality assurance standards of the British Standards Institution (BSI), the International Organization for Standardization (ISO) and the Deutsches Institut f r Normung (DIN), and is based in Hertfordshire, England.